The Norwell Food Pantry is devoted to supplementing the nutritional needs of families at risk for hunger. Families that are struggling to make ends meet can come once a week. They are able to “shop” according to personal preferences for staples (flour, sugar, rice, pasta, cereals), canned fruit & vegetables, meats, soups and basic toiletries. Based on residency and supplies. When donating food, please check the expiration dates before you drop it off, we cannot give out expired food. 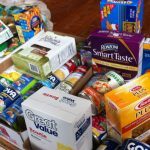 The Norwell Food Pantry, founded in 1991, provides emergency assistance for Norwell neighbors in need. Through the generous support of our community, we supplement food needs for an average of 225-400 people or 90-175 families each month . Food insecure families, elderly, children and adults can visit once a week. They are able to “shop” for nutrition essentials and basic personal care and infant and baby essentials. The Norwell Food Pantry is open 51 weeks of the year. Every year our demand outpaces our giving. Please consider a donation. The Closet is filled with gently used clothes and small household items. Based on residency and supplies. For assistance, contact your School Guidance Counselor, Nurse, Clergy, Norwell Police Department or the Council on Aging. Or you can reach out to us directly by calling 781.690.5050, or sending a message with our contact form. To receive assistance you will need proof of Norwell residency: a valid ID plus a recent correspondence showing a Norwell address.